Over 70 real ales, ciders and craft beers available throughout the week Regular updates on which beers are on will be on our Facebook page (The Swan, Little Totham) and on Twitter @theswanlt. 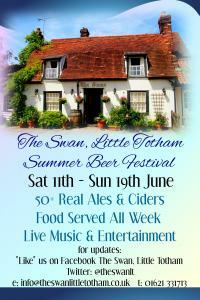 The Swan, Little Totham. CM9 8LB.